Located on Lake Lanier and just over forty miles from Atlanta, Flowery Branch has maintained a picturesque historic downtown. Recent investment, including streetscape improvements and a revitalized train depot, is beginning to revitalize the downtown area, known as “Old Town.” Many of the original buildings in the historic central business district still exist and have been rehabilitated and repurposed. While Old Town needs more economic activity and a denser downtown population to fully thrive, it is already a charming quintessential Main Street. Old Town’s location on the lake is unique. 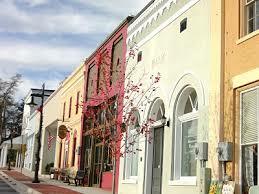 Flowery Branch’s is one of the only (if not the only) Georgia historic downtowns on a lake. It is very close to several marinas, including Aqualand, the largest inland marina in the United States. This waterfront access and its location within the Northeast Georgia Mountain region are a large potential draw for outdoor recreational enthusiasts. Regionally speaking, Old Town’s proximity—12 miles— to downtown Gainesville’s top medical facilities make it a very attractive location for residences. Its location 45 minutes from Atlanta make it an option for people employed downtown. This location, combined with a walkable downtown of small blocks, make Old Town ideal both for young families and for people interested in aging in place. With the city’s recent purchase of key parcels, Flowery Branch is well positioned to become a regional destination with a pedestrian-friendly town center that integrates exciting new development in a historic framework. This plan lays out a path by which the city can act to lead and spur development in Old Town to ensure that it thrives as an economically stable district with a healthy mix of uses, increased density at a comfortable scale, high quality buildings that enhance the urban public realm, and a community of residents and visitors that can enjoy both downtown and Lake Lanier.